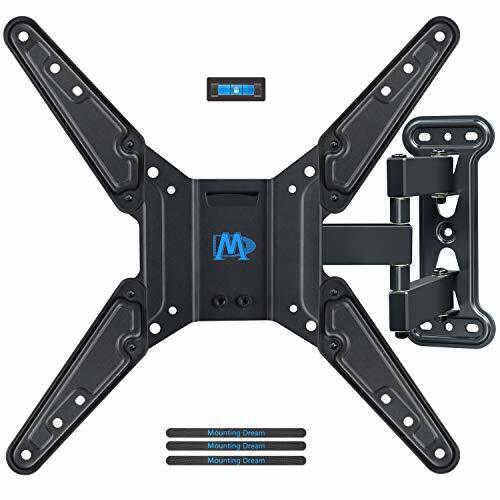 Heavy duty unit fits for most of 26-55" TVs up to 60 LBS, with max VESA/mounting holes spacing of 400 x 400mm. Our mounts are tested with 4 times loading weight claimed. Images on left side will help you see if this mount perfectly fits your TV in the aspects: VESA, stud location and possible blocked input. Not perfect? You can check other Mounting Dream mounts for BEST options. Viewing becomes more comfortable: tilts TV up 5° and down 15° to reduce glare, swivels TV left or right according to your seats position. Pull out to 19" and retract back to 2.9", making your TV alive to move. Easy installation with decent instruction and all included hardware in pre-labeled bags. +/-5° post-installation adjustment allows perfect TV leveling. Comes with bubble level and Velcro ties for cable management. Concrete anchors will be shiped if needed.